Germany’s foreign intelligence agency is increasingly turning its attention to the Balkans, according to a report by German newspaper Berliner Zeitung. The agency, the BND, has not confirmed the story, but the media rarely report on the BND’s work. That they did in this case could indicate that the agency wants the public to know where its focus lies. Either way, the report is consistent with Germany’s broader foreign policy, which has increasingly focused on the Balkans in recent years. Germany is among the top three export destinations for Serbia, Croatia, Bosnia-Herzegovina, Montenegro, Macedonia, Albania and Kosovo and is one of the top European investors in the region, making Berlin the most important EU partner for the Balkan states. Over the past few years, Germany has strengthened its relationship with Serbia in particular, although Croatia has has historically had the closer ties to Berlin. Germany’s improving relations with Serbia are partly due to the economic links between the two countries. Germany is the second-largest importer of Serbian exports and among the top five investors in Serbia. Serbians themselves recognize the benefits of stronger ties with Berlin. A survey released on Nov. 15 indicated that a third of Serbians think German companies are the most desirable investors, offering good salaries and opportunities for career advancement. Germany has taken the lead within the EU on relations with the Balkans states. In 2008, when the financial crisis exposed social and political cracks in the union, hopes started to fade of the Balkan states ever joining the bloc. As less EU funding became available to these states, modernization and reform efforts also diminished. Russia was another important source of external funding for the region, but with the onset of the Ukraine crisis, as well Moscow’s own financial problems, it became clear to the Balkan states that they couldn’t depend on Russia for financial support. They thus turned to the EU – and this meant turning to Germany, the de facto leader of the EU. At the time, Germany couldn’t afford another crisis in Europe and thus wanted to maintain some degree of control and stability in the Balkans, often a source of volatility on the Continent. Berlin was already involved in negotiations over Ukraine and had to deal with the eurozone’s banking crisis, which threatened Germany’s own economic stability. It therefore had to take the lead on the EU’s policy toward the Balkans and help the region avoid economic problems that could destabilize these countries and pose a security threat throughout Europe. In August 2014, Germany established the so-called Berlin Process, a diplomatic initiative to strengthen ties between the Balkan states and the EU. Through this initiative, Germany has made it clear that it sees Serbia as the most important state in the region because of its strategic location. It has put a lot of effort into not only supporting Serbia’s relations with Brussels but also facilitating dialogue between Serbia and Kosovo. In 2017, Germany announced that it would expand the Berlin Process into the Berlin Process Plus, which should increase funding for the region from European countries interested in infrastructure and development projects. Among the planned projects is a highway linking Serbia with Bosnia-Herzegovina and another linking Belgrade to Tirana, Albania, via Pristina, Kosovo. Germany’s interest in the Balkans and in Serbia has grown since 2015, when the migration crisis hit Europe. The main route for migrants trying to reach Germany was through the Balkans. The northern part of Serbia is flat and especially easy to traverse, making the country a particular concern. In fact, Germany views the Balkan states as a critical component of its security, and it is partly for this reason that Berlin has been an outspoken supporter of their accession into the EU. European Commission President Jean-Claude Juncker said in September that Montenegro and Serbia could join the EU by 2025 – a statement likely influenced by Germany. Germany recognizes that there are obstacles to making that happen, but keeping the Balkan states’ EU hopes alive will encourage them to adopt a more pro-Western, pro-modernization stance. Interestingly, the report on the BND’s focus on the Balkans was published the same day that German Chancellor Angela Merkel attended an EU-Africa summit focused on migration. The German government’s handling of the migration crisis has increased public support for Germany’s far right. Mainstream parties, including Merkel’s, lost seats to the nationalist Alternative for Germany party in elections in September, and the chancellor has been under pressure to prevent another influx of migrants. Working with non-EU states, such as those in the Balkans, can help block the route to Western Europe and stop another crisis from emerging. The report on the BND may be a signal to the German electorate that Merkel is serious about controlling migration, a key part of which is keeping an eye on the Balkans. There is another dimension to Germany’s interest in the region. The concept of the Intermarium, an alliance involving countries from the Baltic Sea to the Black Sea, has been building, and the group’s members in Eastern Europe discussed expanding southwest to the Adriatic Sea by including Austria, Croatia and Slovenia. But adding Croatia and Slovenia to this larger alliance, referred to as the Three Seas Initiative, might anger Serbia, which would be left surrounded by members of a group from which it has been excluded. Germany understands this very well. By maintaining a close relationship with Serbia, Berlin may be sending a message to the Intermarium’s Eastern European members as well as to the United States, which has supported the alliance, that it is still a powerful European nation and has an interest in Eastern Europe’s future. In a world where the EU and NATO are weakening, Germany needs to act independently to secure its own interests. North Korea launched an intercontinental ballistic missile this week, its first missile test in two months. The public discourse has centered on North Korea’s ability to strike the U.S. and how the U.S. will respond to this latest test. But South Korea is also a key part of the crisis; it would bear the brunt of a North Korean attack. Seoul has thus developed a political strategy to avoid conflict, as well as a military strategy to respond to an attack should diplomacy fail. South Korea’s primary imperative is to protect Seoul from any threat, including a conventional or nuclear attack by North Korea. To achieve this goal, the South has developed a three-pronged political strategy. First, South Korea sees international sanctions as a way to deter the North from pursuing its nuclear program. Sanctions have produced few measurable results in the past, but South Korea has worked to continue and expand them. After the missile test on Nov. 29, South Korean Prime Minister Lee Nak-yon said his country would work with the international community to implement stronger sanctions against the North. In addition, Japanese Prime Minister Shinzo Abe and South Korean President Moon Jae-in agreed to seek additional sanctions at a U.N. Security Council meeting scheduled for Nov. 30. Second, South Korea has used the Inter-Korean Exchange and Cooperation program to encourage North Korea to avoid activities that could pose a threat to Seoul. Originally set up in the 1970s, the program facilitates cooperation between the North and South through cultural and social exchanges, humanitarian assistance and economic projects such as the Kaesong Industrial Complex. The program has grown significantly over the years: The exchange program included only one person in 1989 and expanded to 186,000 people at its peak in 2008. Trade has also increased, from $19 million in 1989 to $2.7 billion in 2015. But after North Korea stepped up its weapons testing in 2016, South Korea suspended some projects, shut down the KIC and imposed economic sanctions. The exchange of people plummeted to 14,000, and trade fell to $333 million. This strategy thus has also failed to convince North Korea to change its behavior. Earlier this month, Moon promised the North a “bright future” if it agreed to a resolution to the nuclear crisis. If Pyongyang halts its nuclear program, Seoul has argued, it can have access to South Korean investment and technical skills, as well as a high-income market and humanitarian aid. Reinstating all the elements of the Inter-Korean Exchange and Cooperation program is one incentive it can offer the North. But if North Korea does not comply, the remaining benefits from these programs can be cut off. The third element of South Korea’s political strategy is to encourage greater Chinese involvement in finding a solution to the crisis. China is North Korea’s largest trading partner, and though it has agreed to enforce U.N. sanctions, there are reports of noncompliance regarding coal exports from North Korea and financial services. If China fully complied with the sanctions, some believe that Pyongyang would be forced to give in to the South’s demands. But China has its own concerns about North Korea, in particular its fear of a regime collapse that would result in a refugee crisis and an expanded U.S. military presence on the Chinese border. One of the weak spots in this political strategy is that it doesn’t prevent a third party such as the United States from launching a pre-emptive attack against North Korea, which would cause the North to retaliate against Seoul. This is exactly what the South fears might happen and wants to avoid at all costs. After the most recent missile test, Moon publicly stated that all sides must avoid “misjudgment,” a statement meant to discourage a U.S. military response. The closer North Korea gets to a deliverable nuclear weapon affixed to an ICBM, however, the more pressure the U.S. will be under to take pre-emptive action. Keeping the U.S. satisfied that diplomatic progress is being made is a tough task given the North’s history, especially now that Washington fears that Pyongyang’s missiles can reach the United States, not just Seoul. In addition, Seoul has a military strategy, also involving three components, to deal with the North Korean threat. However, it is a mostly defensive strategy. The first component of the military strategy is called the Kill Chain program. It aims to spot impending attacks and destroy the threat. The South would use high-altitude surveillance drones to pinpoint launch areas, weapons facilities and communication hubs, and then use cruise and ballistic missiles and special operations ground forces to eliminate North Korea’s nuclear and missile-launch capabilities as well as its communications networks. It is possible that U.S. military hardware and personnel would also participate. Another component of the South’s military strategy is the Korean Air and Missile Defense plan, which enables South Korea to track and destroy ballistic missiles midair. However, the technology behind missile defense systems is unproven. The final component of South Korea’s military strategy is called Korea Massive Punishment and Retaliation, which, like Kill Chain, aims to destroy the North’s ability to launch nuclear and conventional weapon attacks. But unlike Kill Chain, the focus is on eliminating the country’s leadership, particularly Kim Jong Un. Pyongyang and the centers of government and the military would be destroyed. A number of things can go wrong with this military strategy. Intelligence and surveillance assets can fail to detect an attack. Seoul’s proximity to the border means the time between the launch of a missile and when the missile reaches its target is short, forcing the military to make quick decisions. In addition, though Kill Chain aims to destroy the North’s ability to wage war, it is difficult to fully and accurately map out North Korea’s military installations and launch sites, which leaves Seoul vulnerable. South Korea prefers a political solution to the North Korea problem. A war would leave its capital devastated and would inflict immense casualties. Moreover, even the best-planned military maneuvers succumb to the fog of war. But South Korea can’t control all sides in this crisis – for a political solution to succeed, North Korea and the United States would also have to decide that this is the best end to the crisis. The only way to stand down from a nuclear confrontation is to reassure Kim Jong Un that the United States won’t — and can’t — invade. In confronting North Korea’s adamant pursuit of nuclear weapons, so far nothing has been effective. Pledges to denuclearize the Korean Peninsula have failed. United Nations resolutions have failed. Increasingly severe sanctions have failed. And insults not only fail but also reinforce the hard-line stance of Kim Jong Un. In the latest provocation, Pyongyang resumed its slate of ballistic missile launches, firing a test salvo eastward on Tuesday, Nov. 28. Are there any other options left worth pursuing? Cold War experience offers insight into a basic factor — a posture of strategic reassurance — that has persuaded other countries to forgo a nuclear-weapons option. What is the central concern driving North Korea’s quest for nuclear weapons? Pyongyang claims it is a well-founded fear that the United States and South Korea plan aggression to overthrow the Kim regime. To Americans, that fear seems absurd; Secretary of State Rex Tillerson has explicitly denied any such intention. Yet it is the stated basis for the intensive, costly missile and nuclear programs that make Kim Jong Un so dangerous. It would be prudent to address it directly, demonstrating first that the threat of invasion against the North is unreal and, second, that absent the threat, continued defiance of international demands for nuclear and missile restraint has more sinister purposes. Those approaches rely on policies that helped induce several potential nuclear-weapons states to forego such arsenals. Three critical examples were Germany, Japan, and South Korea — all countries with far more substantial technological bases than North Korea. Their choice of self-restraint rested on many factors, none more critical than the security afforded by military alliance with the United States, bolstered by deployment on their territory of U.S. military forces. As historian Michael Howard explained years ago, reassurance of allies is scarcely less crucial than deterrence of adversaries. Durable strategic stability depends on both. Understandably, attempts to stop North Korea’s reckless conduct have centered on coercive diplomacy and threats of military strikes. It may yet become necessary to employ some measure of force; continued overflights of Japan by North Korean missiles, for example, are powerful incentives to fire interceptors against them. There is nearly universal consensus among analysts, however, that overt military action carries grave risk of escalation to major war. For years, a constant theme of debates and intermittent negotiations has been that Beijing holds the key to halting this disturbing trend. Although China is the Kim government’s main trading partner and strongest security supporter, it downplays its leverage to compel that government to alter course. The Chinese are clear, however, that a nuclearized Korean Peninsula is not in their interest. Gradually, reluctantly, Beijing has been drawn into the multilateral campaign to pressure Pyongyang economically and politically. Recent months have seen China joining strong U.N. Security Council resolutions and stern sanctions against North Korea, particularly in pledging curtailment of trade between the two neighbors. On present evidence, it remains doubtful that even the sharpest diplomatic and economic measures will dissuade Kim from his nuclear and missile ambitions. Perhaps it is time to explore a different initiative: Could China reassure North Korea as the United States reassures South Korea? As Beijing has grown anxious over North Korea’s behavior, it has qualified its 1961 defense agreement with Pyongyang by emphasizing that it would assist against attack — but it would not support the Kim regime if it began a war. That is a constructive stance, but it may well be read by Pyongyang as a wobble that justifies the longstanding policy of self-reliance. The young Korean dictator may have little knowledge of China’s tremendous sacrifices in the war of 1950 to 1953 — almost 3 million soldiers engaged, more than 380,000 were wounded, and 180,000 were killed. Their casualties far exceeded the killed and wounded suffered by the United States; they approach the estimated losses by the North Koreans themselves. Unwelcome as China’s intervention was to America and other nations defending South Korea, those numbers lend credibility to Beijing’s security guarantee. That guarantee would be most credible, however, if coupled with actual deployment of Chinese forces on North Korean territory. A symmetrical policy of reassurance could involve possibly 30,000 Chinese military personnel stationed there, a total comparable to U.S. forces south of the 38th parallel. Yes, it seems counterintuitive to encourage China to strengthen military capabilities in the north. Some may find the notion antithetical to American interests. Shoring up a state with such vicious human rights abuses is a high price to pay for security. Yet the net effect should be to reduce the actual likelihood of war. South Korea and the United States have always had to expect that in the event of war they would face both Chinese and North Korean forces. But the increased proximity of some Chinese soldiers would not alter the military balance. South Korea and the United States are already amply deterred from invading North Korea; a marginal Chinese military presence would not change that reality. What it could do is shore up a policy of reassurance, removing any doubt that China would be engaged in the case of an attack against North Korea. That reassurance could relieve Pyongyang’s expressed fear of American aggression and thus remove the justification for its destabilizing nuclear- and missile-test programs. Coupled with offers to relax economic sanctions and political isolation, this initiative should offer maximum incentive for Kim Jong Un to suspend such tests. 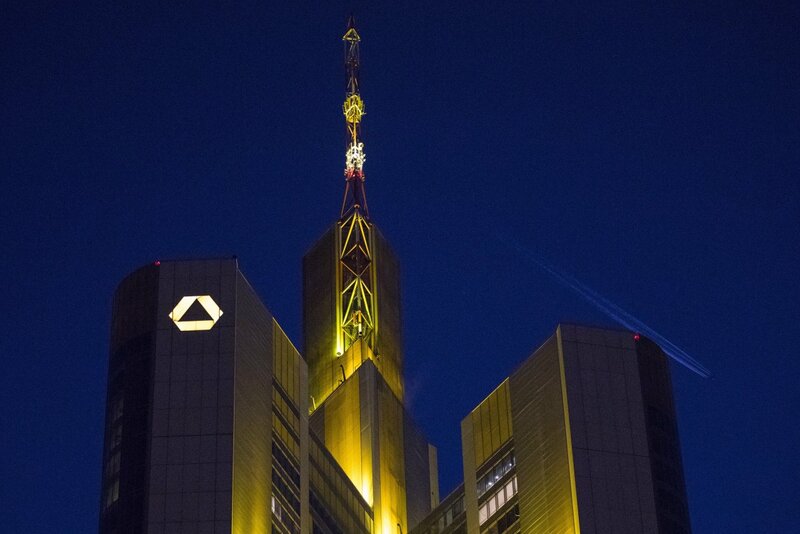 For all of Germany’s economic strength and discipline, its banking system remains a mess. The structure of the German market leaves the odds stacked against major reform. 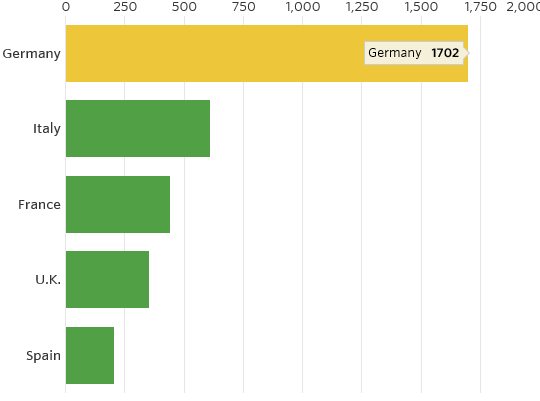 Germany’s banking system is among the most fragmented, least efficient and poorly performing in the eurozone—and it is blighted with about €60 billion of bad loans mainly from the stricken shipping industry. 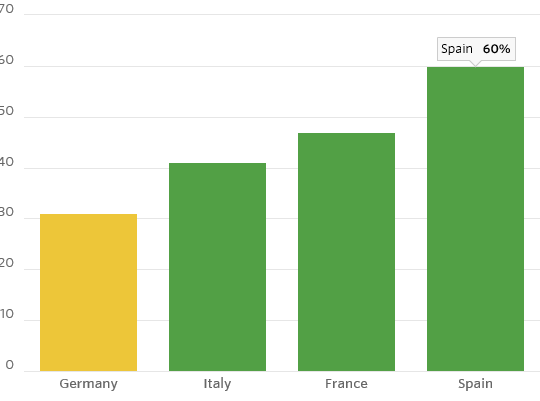 Bad loans make up a smaller portion of total loans at 2.2% in Germany than in Spain (5.4%) or Italy (12%), which is one reason investors don’t panic about German banks when regulators toughen bad-loan rules. The other reason is that more than half of the industry is state-backed or mutually owned anyway. But German banking is a wasteland of chronic problems: returns on equity have been worse over the long term than in other major European economies, including Italy. Contrary to popular opinion, that isn’t because German banks are giving households and companies consistently cheaper credit than they would get in countries dominated by privately-owned banks. Net interest margins on German loans are greater than those in Spain and Sweden and not far behind those in France and the Netherlands, according to UBS. The problem is that German banks don’t generate revenue from anything other than interest income. 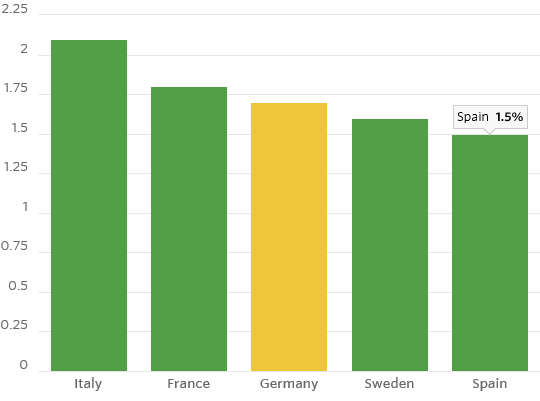 Fee income from customers is sparse—while costs are the highest in Europe. Fee income is weak because German savers invest little in equities—and that has been declining over time, too—so brokerage fees are low and falling. They also take out fewer unsecured personal loans, which would give banks more regular arranging fees than mortgages for instance. Costs meanwhile are equivalent to more than 80% of revenue at German banks, according to Citigroup, which compares with 70% in France, 60% in Italy and 55% in Spain. A merger between Commerzbank and either Deutsche Bank or UniCredit ’s German arm, HVB, might help a little. And Deutsche Bank alone can still do a lot to improve Postbank, its retail arm: Morgan Stanley estimates it could close one-quarter of its branches. 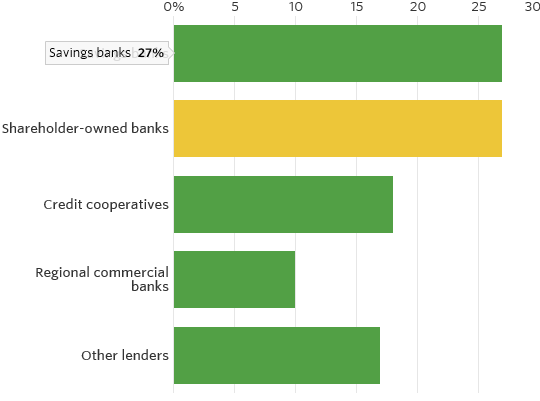 But even if there were a big merger between shareholder-owned banks, this would do nothing to cut capacity from the savings, cooperative and state-backed commercial banks, or to make customers more financially adventurous and profitable. Regional and political interests keep public-sector banks protected. With Germany’s political climate as uncertain as ever -- Chancellor Angela Merkel has been unable to form a governing coalition -- that seems unlikely to change. German financial reform will be a long time in coming.